Samson L. Faison was born in Faison, Duplin County, North Carolina on November 29, 1860.
repeat his first year and graduated number 41 out of a class of 52 cadets on June 13, 1883. His best subjects were Tactics and English and his worst subjects were Engineering and Drawing. Upon graduation he was commissioned a 2nd Lieutenant in Company C of the 1st Infantry. which he returned to Fort Huachuca. of Honor for his actions after assuming command of the expedition upon the death of its commanding officer. to surrender to the American Army, returning to Fort Huachuca on April 23, 1886.
during May 1885 and eleven months following." 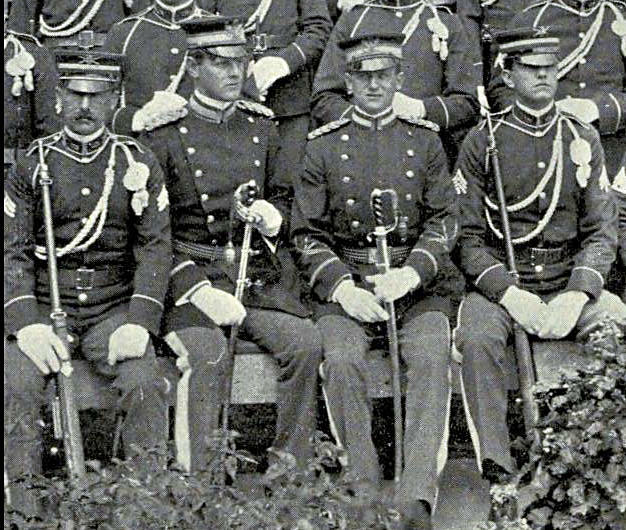 eleventh from the left, directly behind General Crook. 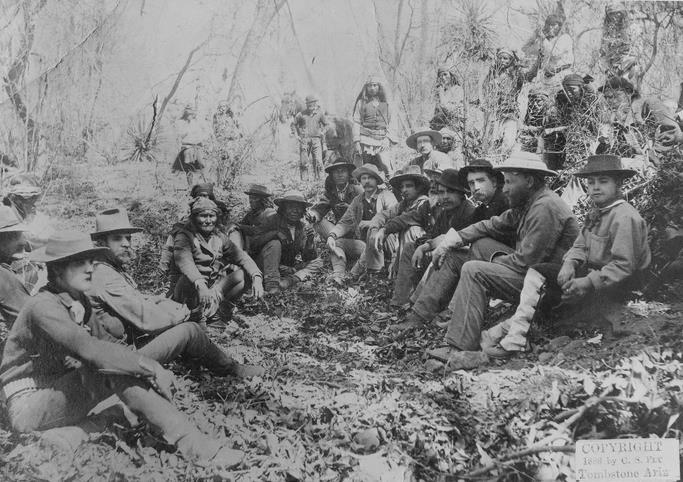 The meeting with Geronimo, March 25, 1886 at Canýon de los Embudos, in Sonora, Mexico. General George Crook is second from the right in the white hat. 2nd Lieutenant Samson Faison is in the foreground, left. To Faison's left is an unidentified officer and to that officer's left is Geronimo. Seated in the same line as Crook is 2nd LT Marion Maus who would later command the 22nd Infantry in the Philippines. Maus is seventh from the right in the line, wearing a light colored coat over his dark blue model 1883 campaign shirt. returning to the Presidio. He then took a leave of absence from May 26 to September 20, 1887.
to April 18, 1889 he was stationed at Alcatraz Island, California before returning to garrison duty at the Presidio. at Santa Cruz, California from August 19 to September 18 when he became stationed at Benicia Barracks, California. attend a course in submarine mining. and 1898 he would be officially assigned to Company K 1st Infantry. 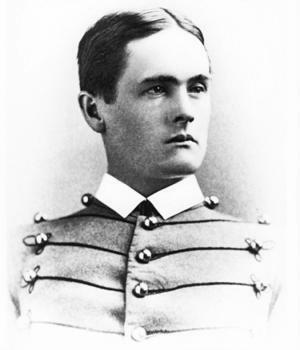 Faison was promoted to Captain of Infantry on July 1, 1898. Faison sailed from San Francisco with the 13th Infantry on April 27, 1899 and arrived in Manila, Philippines on June 1.
service as Acting Adjutant-General of 1st Brigade 1st Division 8th Army Corps. was in engagements against insurgents on November 13.
causeway covered with stone and gravel was built from the Mangaldan River to San Jacinto and thence to the edge of Manaoag." Corps." He was on detached service from this duty at Bautista as a member of the Military Commission from December 5-16, 1900. Then he was on detached service at Manila as Judge Advocate of the Military Commission from December 17, 1900 to January 29, 1901.
in the hospital at Dagupan. From August 22-27 he was again sick in the hospital at Dagupan. October 31. He was the Adjutant-General of the 1st Separate Brigade from November 1 to December 30.
and waves as high as 40 feet. The Sheridan arrived in San Francisco on July 19. Fort Mason and continued to command both through 1903, 1904 and into 1905. He was on leave from May 25 to Aug. 11, 1905. October when he was detailed for duty in the Army's Office of the Quartermaster-General. Faison's detail for service and to fill a vacancy in the Quartermaster Department began on October 29, 1905.
official promotion to Major of the 24th Infantry on June 30, 1906.
with the Regiment at Madison Barracks for the next two years. Faison was assigned to the Army War College in Washington, D.C. as a student officer on June 13, 1910. He was the Chief Umpire at the Camp of Instruction at Mount Gretna, Pennsylvania from July 5 to August 3, 1912.
at Plattsburg Barracks, New York from September 4, 1912 to November 10, 1914. Zone from November 15-25, 1914. Beginning on November 25 he was stationed at Empire in the Canal Zone. He remained on duty with the 5th Infantry at Empire until October 2, 1915. 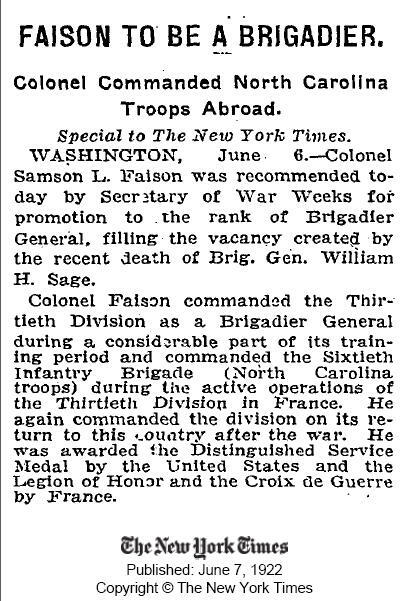 Faison was promoted to Colonel of Infantry unassigned to any regiment on October 2, 1915. He was assigned to the 25th Infantry and from January 25 to February 11, 1916 he was enroute to Hawaii. 25th Infantry on July 6, 1917. He commanded the 42nd Infantry at Fort Douglas from July 17 to August 20, 1917.
which he officially accepted on August 30. Division to Major General Edward Mann Lewis in July 1918 Faison continued command of the 60th Brigade. 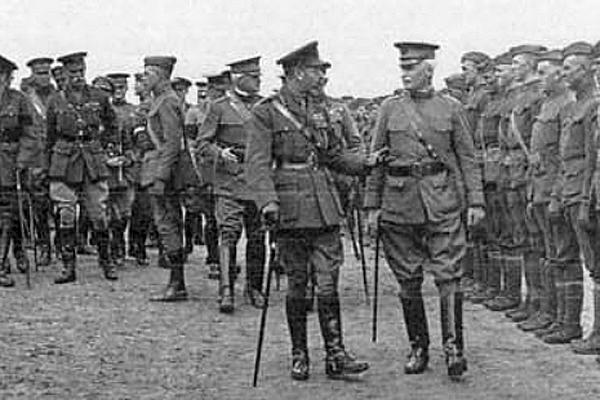 King George V of England reviewing the troops of the 30th Division in France 1918. King George is in the foreground, left, MG Edward M. Lewis is in the foreground , right. awarded the French Croix de Guerre and Legion of Honor. South Carolina on April 3, 1919. Camp Jackson as the 30th Division was demobilized and taken out of service. he reported to Fort Howard, Maryland where he was in charge of National Army Officers at the Headquarters for 3rd Corps Area. 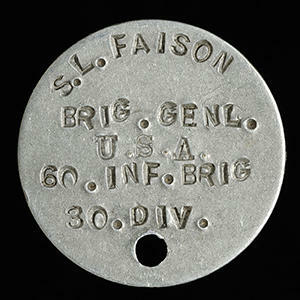 On July 5, 1921 Faison was assigned to the 22nd Infantry. 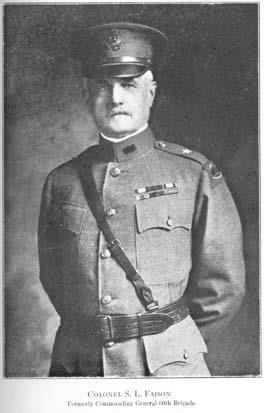 He assumed command of the 22nd Infantry at Fort Jay, Governors Island, New York on July 22, 1921. On June 5, 1922 Faison was offered a promotion to Brigadier General which he accepted on June 14. August 1 to November 30, 1922 awaiting retirement. 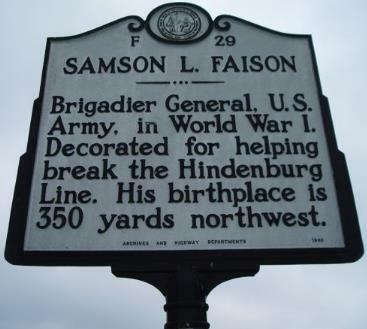 On December 1, 1922 Samson Lane Faison retired from the Army after 44 years of service. He was given a disability in the line of duty. a member of the first American Legion Post in his home State. of Samson L. Faison to Brigadier General. and distinguished services to the Government of the United States, in a duty of great responsibility during World War I.
all marking him as a military commander of great energy and determination. in the city of Faison, North Carolina. Erected in 1950.
leader of the Chiricahua Apache, in Mexico in March 1886.
at the Army War College. After graduation he stayed on as an instructor and administrator. Progressively moving up in the Army ranks, Faison spent time in Panama and Hawaii before the start of World War I.
to break through the line, producing a victory for the Allied forces. 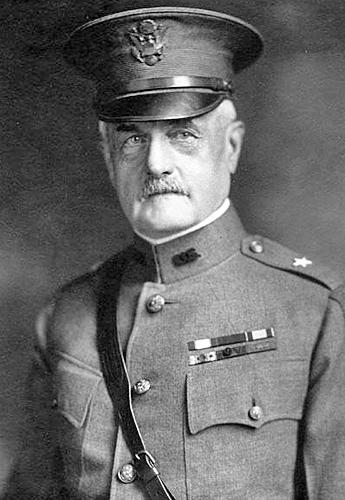 After the war, Faison returned to his rank of colonel. and was buried at Arlington National Cemetery. Died October 17, 1940, at Baltimore, Maryland, aged 79 years. after a most distinguished service of more than forty-four years. and professional standing in the state. friendship of the official staff. for active service in such conditions against such an enemy was a challenge far beyond the requirements of routine duty. under Geronimo, after a career of murder and rapine, retreated to the fastnesses of the Sierra Madre Mountains in Mexico. with Geronimo when that wily savage promised to surrender. The Apache campaign concluded, the 1st Infantry was rewarded by station in the Department of California. San Francisco de Malabon, part of a running fight which lasted for several days. by Insurgents upon the town of San Jacinto. a year he commanded Camp Downs. In February, 1908, he returned home via Suez to station at Madison Barracks, N. Y. 5th Infantry at Plattsburg Barracks, New York, he joined in time to command in the extensive maneuver exercises of 1912.
to the United States and thereafter. Canal Sector (defensive), July 16th to August 30th; Ypres-Lys (offensive), August 31st to September 2nd. The Division was then transferred to participate in the Somme offensive in France, September 2nd to October 20th, 1918.
for the United States and took station at Camp Jackson, South Carolina, for demobilization. 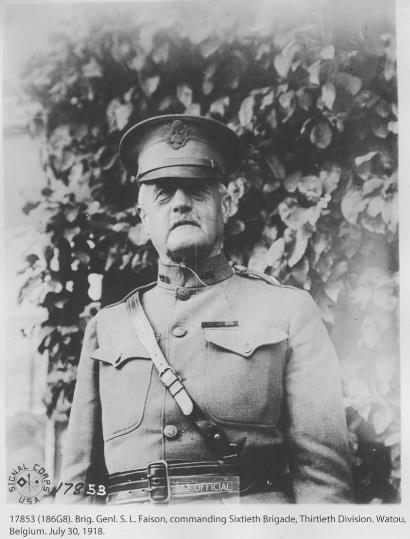 Faison reverted to his permanent grade of colonel on July 15, 1919, and held several transitory commands. and settled in Baltimore, Maryland. against hostile Apaches in Arizona and Sonora during May, 1885, and eleven months following." after one week he was acquainted with every cadet in the corps. his conduct of judicial affairs, "mopping up" as it would now be called, was of inestimable value in pacifying Northern Luzon. brought him the support and friendship of such brilliant soldiers as Generals Loyd Wheaton and William H. Bisbee. operations in which important captures were made, all marking him as a military commander of great energy and determination." too soon. Had America's participation lasted longer there is no doubt that he could have aspired to the highest commands. The French decorated him with the Croix de Guerre with Palms and awarded him the rank of Officier in the Legion d'Honneur. the United States troops, including Faison's Brigade, while attached to the British forces. The following letters from those who knew him well best express the regard in which he was held by those in supreme command. and to his many friends. endeared him to all who had the privilege of his friendship. If I may be of service to you now or at any time, my dear Mrs. Faison, please let me know. General Faison, I wish to express more formally my personal and official condolences. in the War Department join me in expressions of sincere sympathy. Like all strong personalities, Faison made an unconscious distinction between his official and his social character. with no shades of grey. His innate dignity discouraged any undue familiarity at any time or from any person. that of his acquaintances. In his home he was a charming host with the manners of the traditional southern gentleman. at Williams College, and Eleanor Sowers Faison, 2nd. His interment was in Arlington National Cemetery, with full military honors, October 19, 1940. He's gone, and has left not behind him his fellow. 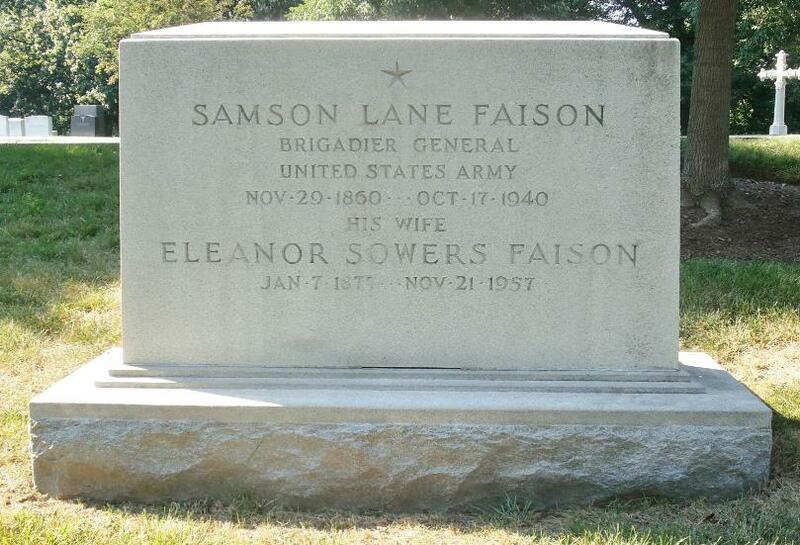 Samson L. Faison died at Baltimore, Maryland on October 17, 1940. He was interred on October 19, 1940.
in the preparation of this page.